When you find the perfect jeans—it’s like winning the fashion lottery. And, feeling your absolute best gives you that lit-from-within confidence that can extend to other parts of your day, too. Because, in your jeans you won’t just feel wonderful—you’ll feel bold, fearless, daring, oh, and pretty stylish, too. We do denim right. How? A little bit of secret data-sauce and a whole lot of love from our expert Stylists. We take the time to learn your favorite rise and what silhouette is best for you—and maybe denim boundaries (ahem, raw hem!). See how our Stylists feel in their jeans & the time-tested tricks that they use to find your new favorite pair. 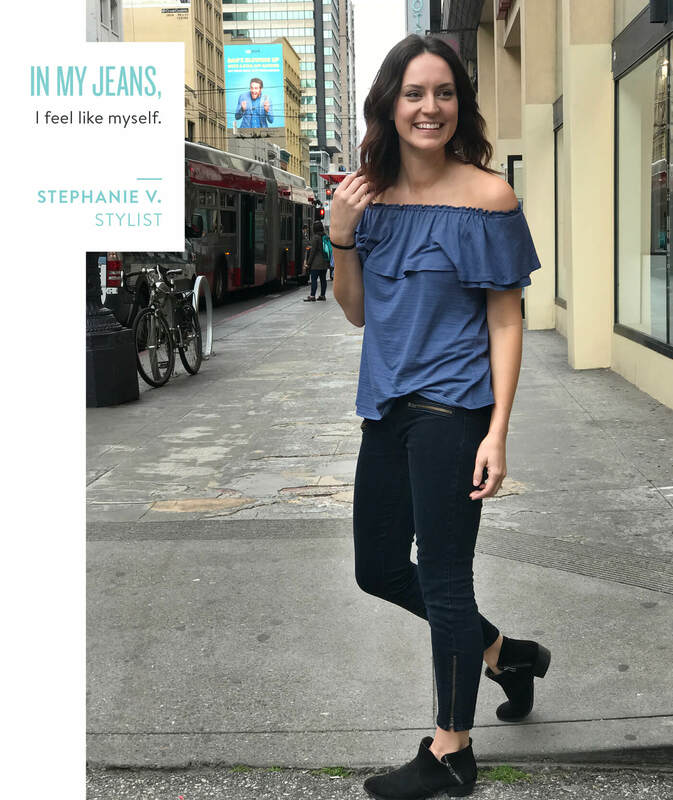 See how our Stylists feel in their Stitch Fix jeans! 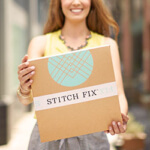 Tell us about your favorite Stitch Fix jeans. I love my Mavi boyfriend jeans! They’re my secret trick to looking pulled together instantly with a quick cuff and fashion sneakers. What do you always look for in a pair of jeans? Rise first: As a busy mom, I always check the rise of my denim. I want to be comfortable and I find that mid-rise jeans fit my body best. Then, add something new: Once I find my favorite fit, I tend to get more adventurous with my washes within that style. For example, I might add a distressed boyfriend jean after comfortably rocking a clean and classic pair. Finish this sentence: In my #StitchFixJeans I feel… like myself! How do you decide which jeans to send your clients when you’re styling them? I always check her fit preferences, then I want to learn when she’ll be wearing them! I love to use denim as a transitional piece and I always find denim to be the core element when creating a look myself. When I’m styling my clients, I want to make sure that I’m picking the perfect pair for her lifestyle so she can pull them out of her Fix and go! Rise first, the rest will follow. My favorite Stitch Fix jeans are my dark wash Liverpool skinny jeans with 4-way stretch. I live in these and I’m not ashamed to say I wear them at least 2-3 times a week! They’re one of the most comfortable jeans I’ve ever owned! Plus, they go with just about everything and never lose their shape (see below for my test to avoid this!). Rise first: I always think about rise first and usually go for at least a mid-rise or a high-rise. Low-rise jeans are a non-starter for me. Stretch second: I am not a fan of jeans that lose their shape after just one wear! When trying on a new pair, I give them my own “stress test” where I bend, stretch and get really physical to make sure they can move with me. Finish this sentence: In my #StitchFixJeans I feel…like I can go anywhere. If there’s a Pinterest board, I always go there first to scout out denim trends they’re loving. If I see mainly distressed jeans or bootlegs, I’ll definitely select a pair for their Fix. Then, it’s onto body shape—if she’s petite and very into distressed jeans, I’ll be sure to send her denim with a petite inseam or a pair that has a regular inseam with the option to cuff. Finally, it’s onto their lifestyle. For example, if she’s an on-the-go mom who’s excited to try distressed denim, I’ll send her a a versatile pair with comfortable stretch and minimal distressing. There are so many ways to interpret a trend so that it fits my client’s needs! Silhouette second—find your favorite style! This is such a hard question. The first pair that popped into my head would be the first pair I ever got from Stitch Fix—a dark wash high rise pair from Kensie. Prior to that, my experience shopping for jeans involved hours in a fitting room, dozens of pairs of jeans and hundreds of dollars just to find one pair that were okay. The first time I got a pair of jeans in a Fix I thought, “No way are these going to fit,” but sure enough they were perfect on me! Needless to say I wore those out pretty quickly and now my faves are Kut From the Kloth boyfriend jeans—I wear them at least once a week. Fit first: I’m a nut for fit— I won’t buy a pair of jeans if they don’t fit perfectly. For me that means finding the right jeans to fit my curvy hips and skinny legs. Then rise: Mid or high rise means the jeans fit over my hips and hit right at my waist and a really skinny silhouette accents my favorite body part—my legs! 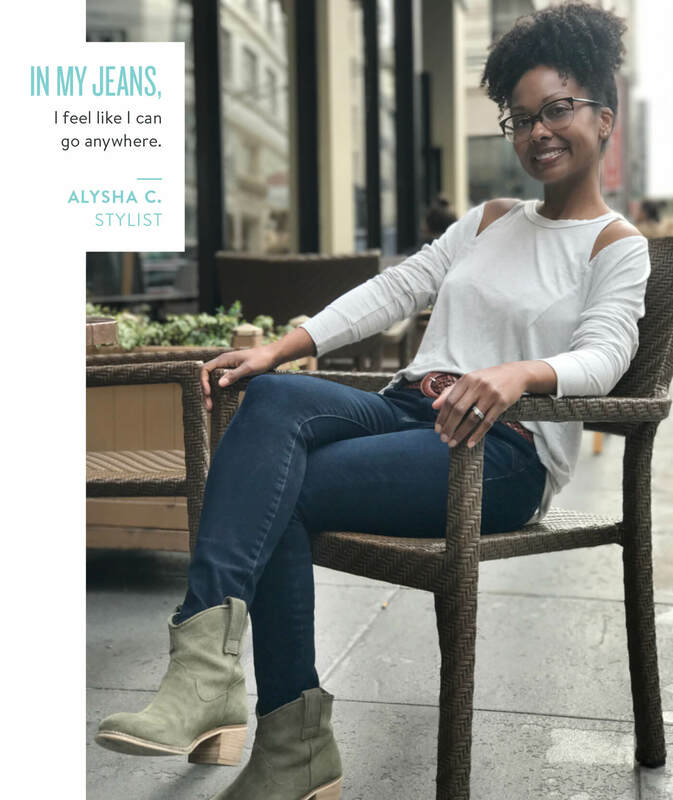 Finally, versatility: I want a pair of jeans that are going to serve a purpose in my closet, from a classic dark wash to wear for dressier days at the office or distressed and cropped for a park day with my son. I always ask myself if they can they stack up with my busy life as a working mom. Finish this sentence: In my #StitchFixJeans I feel… like a modern woman. Fit is key. First I check for my client’s denim silhouette, rise and inseam preference. 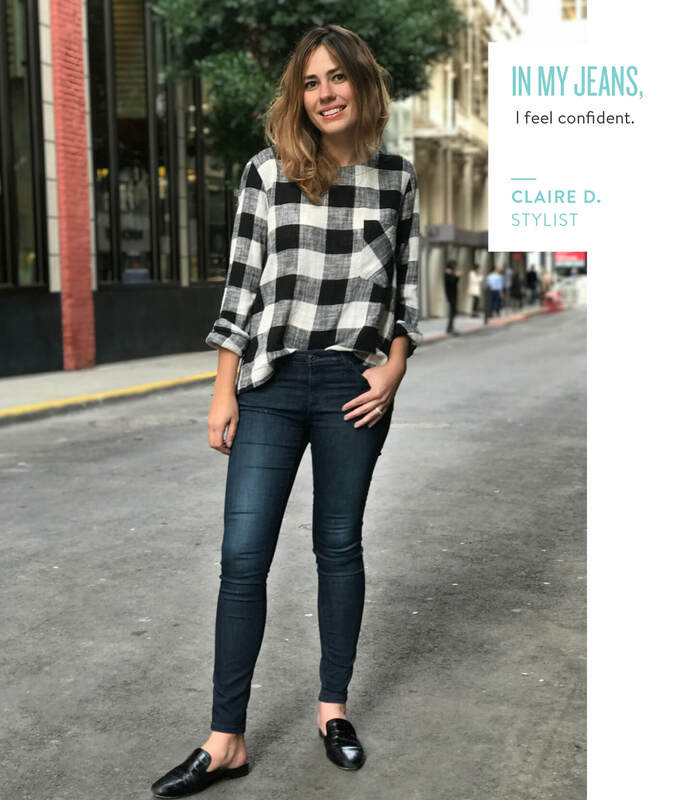 I only want to send jeans that she feels best in, so that info is always my true north—it’s so important to keep your style profile up to date! 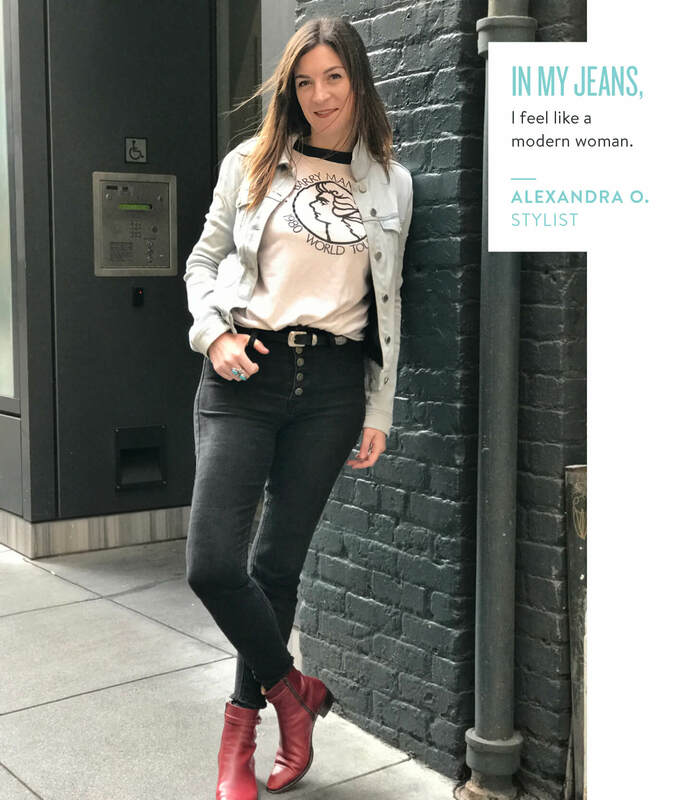 Then, I take a look at what jeans she’s received in the past and try to fill in any gaps with different washes and silhouettes—like black jeans or distressed denim if she hasn’t already received a pair and is open to trying them out. Then, stretch—put them to the test! I am so in love with my AGOLDE jeans from Stitch Fix. They’ve got all the stretch I need to stay comfortable and they hold their shape all day long. Since I’m all about the high-waisted skinnies these days, I reach for them almost every day! When I’m feeling the edgy vibe, I pair them with a casual tee, ankle booties and a bold red lip, but when I’m aiming for a polished, business casual look I tuck in a crisp button down and wear heels. First things first—stretch! I’m on the go almost everyday, whether walking to and from work, running errands or trying to keep up with the kids on the weekends, so above all, I want to feel comfortable. Then, pockets and rise. This may sound silly, but I look for jeans with a smaller back pocket and a rise that sits just at my belly button. Finally, distressing! I’m always down for some distressing for that “lived-in” look. Finish this sentence: In my #StitchFixJeans I feel… comfortable all day long! Being on the more petite side myself, I know how important the right inseam is. Once I find the right length for my client, I think, “what does her average day look like”. I try to find a pair that not only fit and flatter but that will pair easily with things already in her closet so she doesn’t have to think twice. Sometimes it’s a colored skinny she can pair with the grey tee from her last Fix or it’s a pair of straight leg, dark-wash denim that will easily transition from desk to dinner! I know the perfect pair of jeans can make anyone’s day, so I always look for a pair that will add a spark to my client’s closet. What’s your wash? Add a new hue or stick with a classic. My favorite SF jeans are a pair of high waisted skinnies by AGOLDE. They’re so comfortable and literally feel like PJ’s because of the rayon/Tencel/cotton/spandex blend. They also have sentimental value for me—I received my Fix the day before my wedding and was so thankful for the timing. My suitcase got left in my parent’s car, while my Fix oddly ended up at our hotel. Thankfully, the AGOLDE jeans were in this Fix along with tops to pair with it. I was so relieved that it arrived, so much so that I didn’t want to put my 20-pound dress back on. I always look for style and rise then focus on inseam, wash, and construction once I know which style I’m going for. For skinnies and flares, inseam and stretch is extremely important. I love my skinny jeans to hit right at the ankle while I love my flares to skim the ground with heels on. When it comes to the straighter cuts and cropped flares, it’s all about the rise, wash, and interesting details. Finish this sentence: In my #StitchFixJeans I feel…like I can be uniquely me. I always pay close attention to what my clients are asking for and what their preferences are. Then I focus on body proportions and height to determine what inseam and rise would work best. Feedback is also key! If a style isn’t working, I do my best to read through feedback and understand where and why a pair of jeans isn’t working. From there, I try different styles that work for my client’s body types and encourage feedback so together, we can find that perfect pair. I love this pair of dark wash skinnies from AG Jeans! They’re incredibly comfortable, versatile and will never go out of style. Our office is pretty casual, so some days I’ll wear them with an off the shoulder top or if I’m feeling more button-up (literally), I’ll reach for a collared button-up. The one constant? My go-to jeans. Soft hand-feel: Whenever I’m on the hunt for a new pair of jeans, I literally feel around to find the softest pair. Sounds weird, but it makes for a seriously comfortable wear all day long. 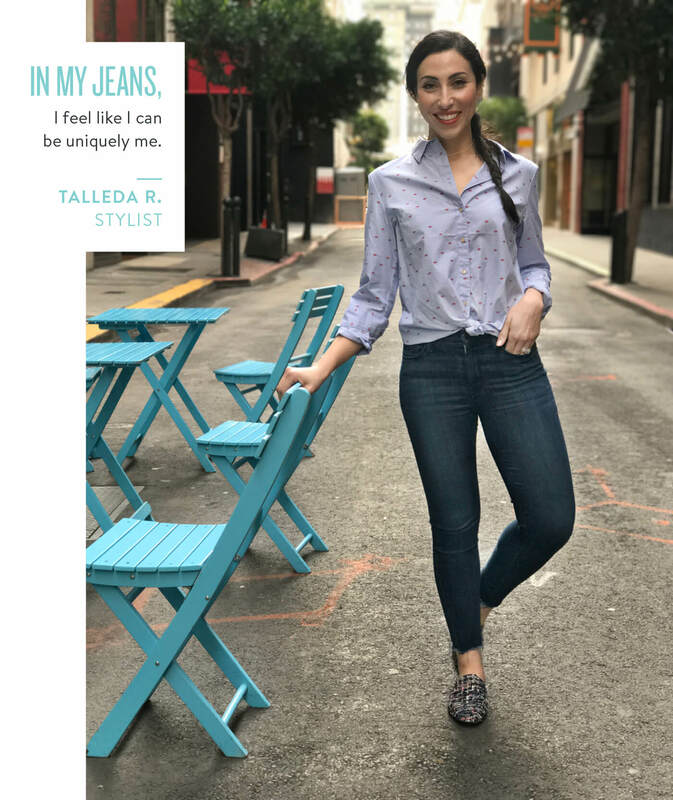 Jeans I can move in: From sitting at my desk to walking around the city, I always make sure that I can move around in my jeans. Finish this sentence: In my #StitchFixJeans I feel…confident. When I’m styling my client’s Fix, I look for any denim gaps that I can fill in. But even when I’m trying to push her out of her comfort zone, I reference her favorite silhouettes as a starting point. If she’s tried a bootcut jean and liked it, I’ll try sending her a more dramatic flare jean. It’s all about learning what my client loves and how comfortable she feels about trying new items! Put it all together now—can your new jeans keep up with you? Do you feel some type of way in your #StitchFixJeans? Share a shot of you in your favorite pair and tell us how you feel! Ready for a new pair of jeans? 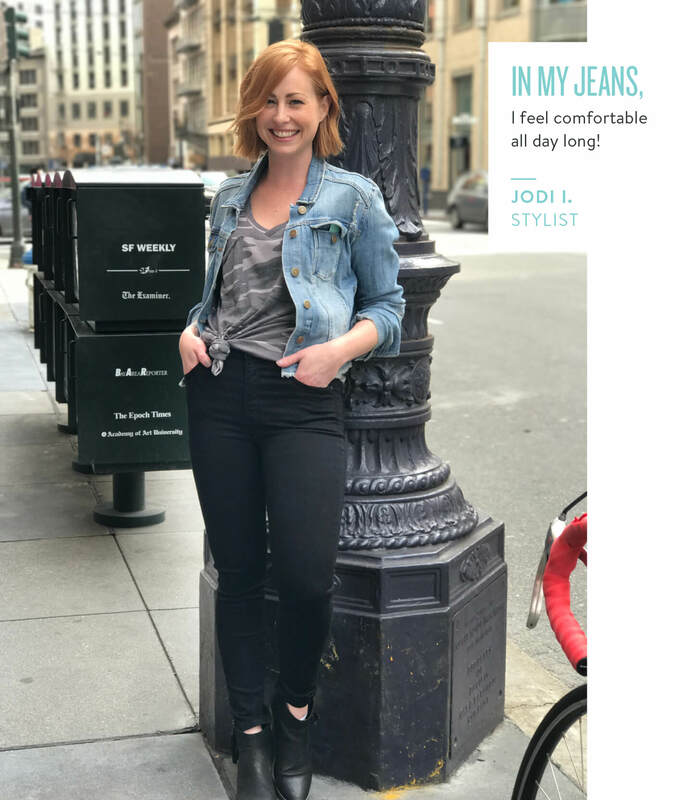 Give your Style Profile a refresh & tell your Stylist what your denim preferences are at StitchFix.com!